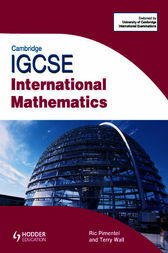 This brand new book has been written especially to support University fo Cambridge International Examnination's International Mathematics (0607) syllabus. Students following this syllabus are expected to use graphics display calculators for certain topics, and this text book includes clear, step-by-step instructions and illustrations on how to use both Casio and Texas calculators. The book follows the order of the topics in the syllabus, providing full coverage of the Extended curriculum. There are plenty of worked examples and questions, including student assessments. There are ICT, investigative, and modelling tasks throughout. The accompanying website has powerpoints for classroom use, as well as 'Personal Tutor' audio-visual worked examples. Answers, an index, and a glossary are also included.